The illustrated Spyderco Knife is the Spyderco Dice Knife, designed by Eric Glesser, that features a 2.52" drop point blade made of CTS XHP stainless steel, .118" thick. The blade of this Spyderco knife has a full flat grind, a notched thumb rest and choil for secure grip, the Spyderco hole and a Flipper for ambidextrous one hand opening. The handle, 4.05" closed, has a black carbon fiber / G10 laminate front scale over a skeletonized titanium liner, a titanium back scale with R.I.L. (Reeve Integral Lock) and a lanyard hole. 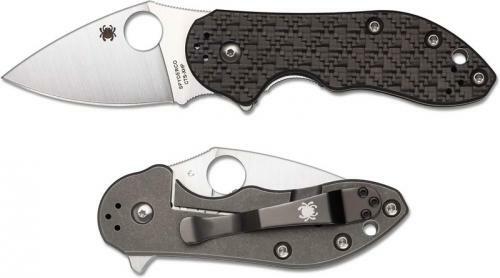 A side to side and end to end reversible stainless steel pocket clip is included with this Spyderco Knife. The Spyderco Domino Knife has an overall open length of 6.57" and it weighs 3.7 ounces. Made in Taiwan. From the Spyderco website: Approximately 15 percent shorter than its bigger brother, the Domino, the Dice is an extremely compact, high-performance flipper folder optimized for everyday carry. Its full-flat-ground CTS® XHP blade offers exceptional cutting performance and both a Kit Carson-inspired flipper and a fully functional Trademark Round Hole™ for a full scope of opening options. Its handle features a solid titanium scale on one side and a titanium liner and Cubic Check carbon fiber/G-10 laminate scale on the other. A robust Reeve Integral Lock (R.I.L.) with a long-wearing hardened steel interface provides the blade lock-up, and a four-position pocket clip - a unique feature for a flipper-style knife - supports ambidextrous tip-up or tip-down carry. The Spyderco Dice is a great knife, the size is perfect for everyday use. The steel is superb, much better the S35VN and it holds an edge for much longer. The flipper motion is outstanding. I recommend this knife.